There are four primary ways that you may be able to get involved with our ministry at Kent State University! 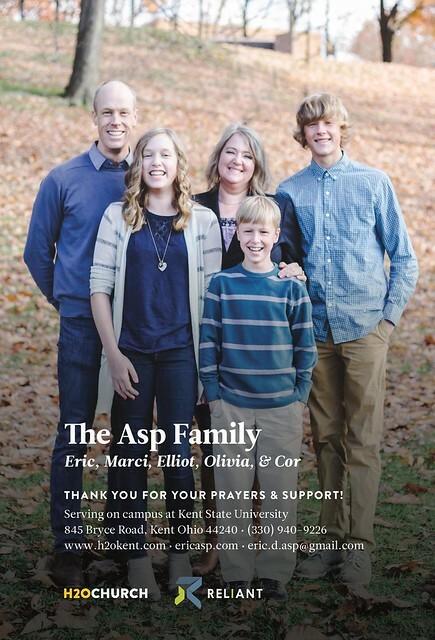 First and foremost, we would greatly appreciate your prayer for our family, for the work of H2O, and for the campus of Kent State University. Check our Prayer Letters for all of the latest news and prayer requests. In addition, you can download a high-resolution copy of our most recent prayer card (as seen to the right), which we hope will help you to remember us in prayer. Secondly, we challenge you to consider how God might want to use you as a missionary to a different people group. A brief review of Our Story shows that God can use ordinary people in extraordinary ways, if they’re willing to follow Him. Perhaps you would like to help organize a short-term missions trip, helping to expand the developing network of partnerships between collegiate churches in the American Midwest and young urban churches in the North Sea region of Europe. Perhaps you would like to travel with me on one of my trips to Europe, to get a first-hand view of God’s work in that part of the world. Or perhaps you’re thinking about a career in full-time ministry and/or international missions. Jesus said that “the harvest is plentiful, but the workers are few” and then instructed us to “ask the Lord of the harvest, therefore, to send out workers out into his harvest field.” So if we can help you think through this, please let us know! Thirdly, we need people who will partner with our ministry financially, to allow for us to be involved in full-time ministry in Kent. For the last fifteen years, our ministry has been generously supported by a grassroots network of individuals, families, and churches who give regularly to Reliant Mission (formerly known as Great Commission Ministries), on behalf of our ministry in Kent (and previously in Amsterdam). However, costs for ministry in Kent continue to rise, and we must continue to trust God for the funding of His work in this unique environment. Some people give $5 a month; some people give $500 a month — and anywhere in between — but we like to ask people to consider giving somewhere between $50 and $100 per month, as this is an amount which seems manageable for many people while still providing a huge help for our ministry. If you’re interested in helping in this way, you could download a printable giving form. Or you could even give on-line through Reliant’s on-line giving technology. In any event, however you might choose to give, we would greatly appreciate your involvement in this way! And finally, you could help us by connecting us with other people who might be interested in hearing about our ministry in Kent. Maybe you know someone who is interested in collegiate ministry, or in international missions, or in youth work, or in European issues… Any of these types of people could be helpful in pulling together the entire team that we need to effectively minister in Kent (through the aforementioned ways of getting involved). Our circle of acquaintances is limited, so if you know anyone who we could talk with, please pass along their name and contact information, via the e-mail address below. If you are interested in joining us and Reliant, through partnering with us in any of these ways — or even if you’re simply interested in finding out more about it, please email me at eric.asp@reliant.org. Thank you for your prayerful consideration of personal involvement with the work of God’s Kingdom at Kent State University.